Delma, our Dental Hygienist, is a specially trained member of the dental team who focuses on preventive dental health and treating gum disease. She will show you the best ways to brush and floss your teeth to keep your gums healthy, avoid bad breath (halitosis), reduce staining and prevent tooth decay. She will carefully remove the scale (or tartar), which forms a hard deposit on your teeth, and show you how to stop it coming back. Gum disease is a condition that results in inflammation of the gums and the tissues that keep teeth secure in the jaw bone. It is caused by plaque, a soft, sticky film containing bacteria and food debris that adheres to the teeth. It commonly forms a creamy, yellow coating, especially at the gum line. If it is not removed daily, the bacteria can cause the gums to become inflamed. This condition is known as gingivitis. The gums can also look puffy and red and bleed on brushing. It is easily treated by changing your oral hygiene technique and by professionally removing the tartar. If plaque and tartar remain on the teeth, they can damage the ligament that attaches the gum to the tooth. If this persists, it destroys the ligament that secures the tooth to the bone, and this is known as periodontitis. Yes, it can. However, successful treatment depends on how early it is caught and how meticulously you clean your teeth and gums. The more advanced the periodontitis, the harder it is to stabilise. Your dentist will carry out a full mouth pocket chart (a pocket is the gap between the tooth and the gum), measuring in millimetres the depths of the pockets that have developed, the areas of bleeding, pus, mobility of the teeth and recession. 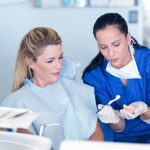 They will take x-rays to look at the bone levels and formulate a treatment plan for the hygienist to follow, which will typically involve several appointments. An oral hygiene assessment and intensive oral hygiene instruction. A basic clean to remove larger deposits of tartar. Follow-up treatment where the mouth is cleaned in sections as tartar removal is time-consuming. This may involve using a local anaesthetic. Instruments to remove deposits and check for a smooth finish. An ultrasoniccleaner, which uses vibration and water to remove deposits and flush out the pockets. As gum disease needs constant work to keep it in check, the pocket charts are repeated and compared at regular intervals to ensure gums stay stable. Can gum disease develop around implants? Yes. It is called peri-implantitis – a destructive inflammation of the gums and bone surrounding implants. The disease destroys the gum attachment to the implant restoration, leading to infection and bone loss around the implant. Plaque and tartar will also form around the implants and the implant crowns if not removed every day. We recommend regular professional cleaning around your implants to maintain healthy tissues and prevent unwanted complications and eventual failure. If you would like to see our hygienist, please contact us or speak to your dentist.